[This is an extract of Katherine Harris' fascinating story, which is reproduced in full with many more pictures on the Archive tab. 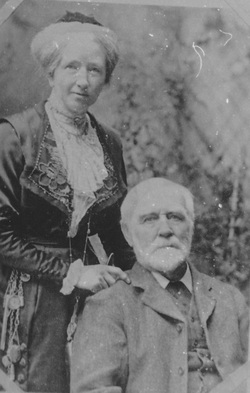 Katherine was writing of her childhood in the early 1900s, but the Gale family were born much earlier at the height of the mid-Victorian industrial boom. In the house at Old Jockey Cottages lived a really delightful elderly couple, Mr and Mrs David Gale. Mr Gale had been born and bred at Blue Vein Farm and his wife came from Leigh-on-Mendip in Somerset. They had first met when she worked at Hatt Farm for the Pinchen family who were also Mr Gale's employers. Later Mrs Gale worked in the Grosvenor district of Bath, and she proudly told me how her young man walked the six miles there and six miles back to visit her on Sundays. They were married at the nearby St Saviour's Church in 1875 when the bride was nineteen years of age. During my childhood I spent many happy hours with the Gales and as a tiny tot I called Mrs Gale Bommy. This was quite a concession by my parents as I was brought up to address and refer to all grown-ups as Mr, Mrs or Miss. The Gales' joint income was one pound a week Old Age Pension and with other old folk they revered Lloyd George for initiating the scheme. It saved the very poor from ending their days in the workhouse or being financed by their children. However, many children did help their parents, and the Gales' younger daughter, Emily, married to a Swindon postman, paid their rent and bought their coal. Every shilling made a difference in the 1920s. The Gales had one other child, an unmarried daughter, Edith, who was employed as a maid in a house in Bath. During their married life the old couple had lived at the Old Turnpike and in Jefferies Cottage, where Emily was born. In their later years they moved next door but one to us. Their house had two advantages over the others made from the old ale-house next door. Firstly it had a back door, and secondly their front door boasted a smart black knocker. Like other houses the front door led directly into the room intended to be used as a kitchen-living room. The grate contained an oven but it was smaller than the one in our house, and quite inadequate for a family. It was kept well black-leaded and the brass knob on its door always shone, but the oven was not used. Although Mr and Mrs Gale always referred to this room as the kitchen, it was kept as a parlour, while they lived, ate and, for what reason I do not know, slept in their inner room. On the low fire there a kettle could be heated or a pan of vegetables cooked. A trivet fixed on to the bars helped to support the containers. It was in their wash-house that the Gales did most of their cooking. As it could be entered without going outside it proved most convenient although it was rather dark. Mr Gale made an oven from a cubic biscuit-tin by hingeing the lid with wire threaded through the holes. Positioned so that the lid or door was in the front, it looked like an oven and was actually larger than the ridiculously small one in the kitchen. It fitted nicely on the top of their double-boiler oil stove and indeed worked quite well. The stone copper in the corner of the wash-house was used on Mondays, and having no wringer Mrs Gale wrung all her linen and garments by hand. I can see her now, twisting a sheet around her arm as she squeezed out the water until the sheet was spiralled snake-like along her arm. The wash-house door opening on the garden was their back door. Mr Gale had trained honeysuckle and rambler roses over a rustic porch. A laburnum tree grew on one side of this shelter and in the summer it was sheer joy to sit in this sweet-scented arbour. The Gales' house is still clear in my mind, especially the room they called the kitchen. Roses climbed up the wallpaper and the lower half of the window was covered with a lace curtain. A dresser filled with cups, saucers and plates was against one wall, and a chest of drawers by another wall. Below the window stood a highly polished mahogany table where treasured ornaments were displayed. In the centre of the room there was a plain wooden table covered with a red and black thick patterned table cloth. There were small chairs in the room but Mrs Gale's pride and joy was the sofa. A visitor would be invited to sit on this and would most likely be told that David, for Mrs Gale always referred to her husband so, had made the sofa when he was a young man. It was made of wood and covered with red and black material. Cushions to match were arranged along the back and on the seat was one long cushion filled with straw. This crackled when sat upon and with every movement continued to do so! Among the many pictures on the walls hung two china plates decorated with flowers and bordered with gold leaf. Gold lettering showed they were presents from Weston-super-Mare. Daughter Emily and her family often visited the old couple, and in due time the grandchildren brought their intended - Mrs Gale's word - to be introduced. The courting couple would be invited to sit upon the sofa, as being a romantic, the old lady thought they should be close to each other. But I doubt if they were very comfortable on that rather high seat with the straw-filled cushion. To cheer up the old people, their grandchildren gave them a wind-up gramophone and records of hymns and marches. However, the recipients were not interested in this form of amusement. They thought such entertainment was really for the younger generation. So when the grandchildren were expected, the records and the gramophone with its big horn were brought out ready to be played. They didn't appreciate hymns or marches either. The Swindon family eventually bought a car - a green Austin Seven with a folding black hood. Visits became more frequent when the long walk from Box Station was a thing of the past and on fine Sunday afternoons the old couple would be taken for rides in the car. This was a rare treat as few people owned cars at that time. However there were occasions when the Gales could be certain of riding in a car. These were Election Days. 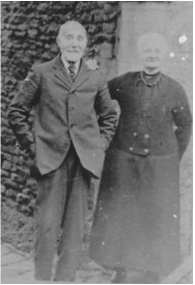 Mr & Mrs Fuller, landlords of the Gales Miss Chappell would take them in her Sunbeam to cast their votes at Box. The car would be decorated with blue rosettes but the Gales were staunch Liberals, and were careful not to tell Miss Chappell of their true allegiance. The Fullers, our landlords, were Liberals and their tenants and employees were inclined to vote likewise. Mr and Mrs Fuller who lived at Neston Park travelled around their Estate in a landau drawn by two horses. Only once did I see them in this, and when they halted at The Old Jockey Mrs Gale curtsied - the only person in the waiting group of women and children to do so. The Gales were of a generation fast passing away. Having lived in the vicinity all his life, Mr Gale could remember how his father detoured by way of Wires Lane at Wadswick with his horse and cart, to get to Box dodging the turnpikes. 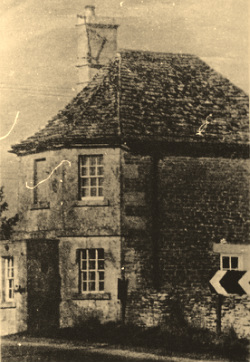 The Horse and Jockey Inn closed before he was born, but Mr Gale remembered when it became a farmhouse. Both he and his wife always referred to the building as the farm, although it had been divided into smaller dwellings for many years. It was from the Gales that I learnt that our houses had once been roofed with thatch. Mr Gale kept his garden in an immaculate condition and, as was customary, grew a lot of vegetables. Both he and his wife were fond of flowers and their borders were full of old-fashioned plants. These they called by their common names such as lads-love, granny-bonnets, snapdragons, red-hot pokers, and creeping jenny. The pendant blossoms of the laburnum tree were golden chains. There was a patch of grass between the well and their house which was kept neat and tidy by Mr Gale. He cut it with a pair of shears. It was actually common ground for all of us but it became known as Mr Gale's lawn. No-one else had a lawn. There was grass growing in front of the old inn but that was kept short by the fishman's horse! I believe Mr Gale was the only man in the hamlet to sweep his own chimney. He used a branch of holly as a brush and straight sticks as rods. These worked and did not cost anything. Mr Gale always seemed to know if a horse had dropped manure on the road, for he would be there with a bucket and shovel in no time at all. This he spread on his garden, and this again was free. Mrs Gale always wore a hat perched on top of her white wavy hair when outside the house even when hanging out the washing, and over her full length skirt she usually wore two aprons. Underneath would be a starched white one and over this a black apron. The top one would be hastily removed if there was a knock on the front door, as Mrs Gale felt that wearing a clean white apron was the proper way to receive a visitor. All the other garments worn by the old lady were black. Her outdoor coats were fitted at the waist and knee length. Her skirts almost touched the ground, and with these were worn blouses with long sleeves and high necks. Mrs Gale called her blouses bodies, no doubt a corruption of bodices, and with her other day to day garments they hung on hooks on the back of their bed-sitting-room door. Mr Gale's clothes were stored in a wooden chest. Mrs Gale was past middle age when her daughters persuaded her to wear knickers or Bloomers as she called them. It was not until the Victorian era that they were considered necessary and it would have taken time for the new fashion to spread to country districts. 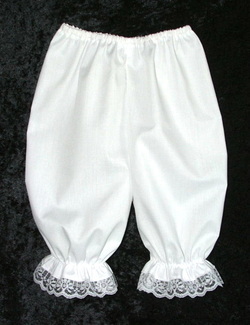 The Bloomers were made of flannelette and reached below the knees. Each voluminous leg was separate and only connected by a waistband. This was fastened by buttons. The lower ends of the legs were gathered into a band to fit the calf, and on the washing line, for that is how I know about these Bloomers, they looked like two funnels. Being almost two garments, I am inclined to think these early designs led to the plurality still in use today: eg pants, knickers, trousers, briefs and jeans. On Sundays, Mr Gale always wore a suit of thick grey cloth. In the morning he could be found sitting in his wicker-work armchair reading the Bible in a half-aloud voice, for he was unable to read otherwise. My mother called on the old couple every morning and would take them yesterday's newspaper to see. This with the Wiltshire Times was the extent of their other reading. I am not sure if Mr Gale could write but I know Mrs Gale could, although she was always willing to allow me to address her Christmas cards. As I grew older I was permitted to choose her cards from the selection at the village shop. As the years passed by these dear old people became less active, so their unmarried daughter gave up her work in Bath to live at home and care for her parents. Three persons could not manage on the Old Age Pensions drawn by the old couple. Edith was obliged to apply for Parish Relief, and so Mr Horton who had called on Sis Moss before her marriage came again to The Old Jockey with those few shillings so vital to a caring daughter. Mr and Mrs Gale lived to celebrate their Diamond Wedding and although by then we had left The Old Jockey, my mother was able to return to share their joy. The happy pair were twice photographed, once indoors sitting on their sofa with the crackly straw-filled cushion, and then outside standing together in the archway of the curtain wall. It appears that Mrs Gale was persuaded to leave off both her hat and her white apron on this auspicious occasion. Of the houses that clustered around the old turnpike at Blue Vein was a bungalow containing three rooms, and the roof was of corrugated iron. A sheep hurdle served as a garden gate. This was fastened to a post with string. Here lived Miss Mary Gale all alone after the death of her brother John. David Gale our close neighbour was another brother. The bungalow was built on common land, that is on the wide grass verge bordering one of the fields of Blue Vein Farm where the Gale family had lived for three generations. The lease did not include a fourth generation and this meant that the two unmarried children would have to find another home. Their father decided to use the grass verge and began by building a pig-sty and run. From time to time he enlarged it, and eventually it became big enough for human habitation and the run large enough for a garden. Whether pigs were ever kept there I do not know. But on their father's death John and Mary moved in, claiming the property by squatter's rights. Mary was very proud of owning her own home, something no one else around did. Not even Miss Chappell owned Hatt House at first. A low doorway led into Miss Gale's living-room which smelt of apples, potatoes and smoke. On the hob of the iron cooking range lay John's watch, so much better kept warm, as Miss Gale said, and it was her only timepiece. The ceiling and walls had been whitewashed but were almost black when I knew the place. The one very small window covered with a lace curtain let in very little light, but it was enough to see the sacks of potatoes and boxes of apples stored under the wooden table in the middle of the room. A chest of drawers topped by a swing mirror, and some kitchen chairs completed the furnishings. A sack before the fire did duty as a hearth rug on the stone floor. Two doors from this room led to bedrooms but as no one I knew had seen inside them, I thought they must be full of treasures. Mary Gale dressed in Victorian style, and wore light coloured garments in winter and summer. She wore a cape, never a coat, and her hats were miniature trilbies, white with hardly any brim. They were decorated with flowers. Her hair was dyed black, probably from plants she grew in the garden, for she was extremely knowledgeable about herbs. The dye had run onto her forehead where it left a brown stain. This dark colour on her skin puzzled my childish mind until my mother explained how it may have happened. I doubt if Miss Gale was particularly clean, as having no water supply on her property, she was obliged to fetch water from Blue Vein Farm. Carrying buckets of water was heavy work for an elderly lady. Every Friday Miss Gale walked to Box via the Drilly to collect her pension. Owing to her out-of-date style of dress, she was considered to be a curiosity by both grown-ups and the children in the village. I last saw Miss Gale in the 1930s looking as she always had done, like a character from Dickens. After her death her home was sold, and later it was enlarged into an attractive residence.